Bonnie R. Kraemer has worked in the disability field for over 15 years. 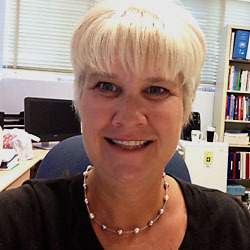 She received her Ph.D. in Special Education from the University of California, Riverside in 1999. Dr. Kraemer worked as an Assistant Professor of Special Education at the University of New Mexico in Albuquerque for 3 years prior to coming to San Diego State in Fall 2003. She is an Associate Professor in the Department of Special Education and coordinator of the Level I program in moderate/severe disabilities. Dr Kraemer is also actively involved in the masters in autism program and the BCBA program. Her areas of teaching and research lie in the field of severe intellectual disabilities, with a specific focus on families, instruction, transition, quality of life, and positive behavior supports. Neece, C. L., Kraemer, B.R., & Blacher J. (2009). Transition satisfaction and family well-being among parents of young adults with severe intellectual disability. Intellectual and Developmental Disabilities , 31-43. Kraemer, B. R., & Blacher, J. (2008) Transition for Hispanic and Anglo young adults with severe intellectual disability: Parent perspectives over time. Journal on Developmental Disabilities , 14 , 59-72. Kraemer, B. R., Cook, C. R., Browning-Wright, D., Mayer, G. R., & Wallace, M. D. (2008). Effects of training on the use of the Behavior Support Plan Quality Evaluation Guide with autism educators: A preliminary investigation examining positive behavior support plans. Journal of Positive Behavior Interventions, 179-189. Cook, C. R., Crews, D., Wright, D. B., Mayer, R., Gale, B., & Kraemer, B. (2007). Establishing and evaluating the substantive adequacy of positive behavior support plans. Journal of Behavioral Education, 16, 191-206.